Conceived with the aim of sorting fact from fiction over genetically modified (GM) crops, this book brings together the knowledge of 30 specialists in the field of transgenic plants. It covers the generation and detection of these plants as well as the genetic traits conferred on transgenic plants. 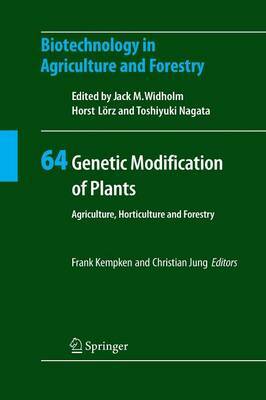 In addition, the book looks at a wide variety of crops, ornamental plants and tree species that are subject to genetic modifications, assessing the risks involved in genetic modification as well as the potential economic benefits of the technology in specific cases. The book's structure, with fully cross-referenced chapters, gives readers a quick access to specific topics, whether that is comprehensive data on particular species of ornamentals, or coverage of the socioeconomic implications of GM technology. With an increasing demand for bioenergy, and the necessary higher yields relying on wider genetic variation, this book supplies all the technical details required to move forward to a new era in agriculture.